The waves splash against the side of the small boat as it turns toward shore and the brilliant orange umbrellas at the Santa Croce beach. Somewhere in the mountains soaring above the Amalfi Coast road twists and turns its way through Vettica, a hamlet of Amalfi, and closer by the buoys bounce up and down in the waves. 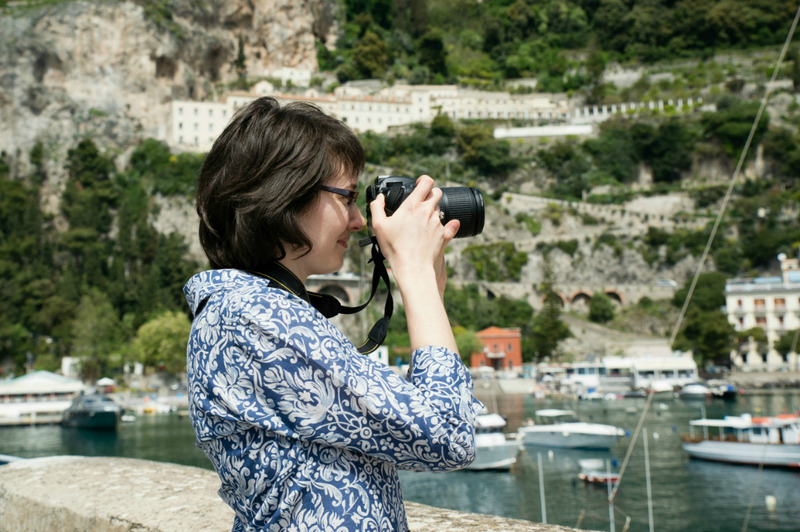 This little rocky cove is a piece of heaven on the Amalfi Coast – miles away from all the hubbub in Amalfi just a short boat ride away. I know I’ve written about Santa Croce beach several times here on Ciao Amalfi, but it’s just one of those spots that calls to me again and again. And when you step off the boat and are greeted with this view, how could you not be smitten? Stepping off the boat to quite a view! The clear water and and rocky beach are two of the reasons this is such a remarkable spot. The restaurants just steps from the water serving fresh fish and Amalfi Coast dishes complete the perfect setting. When we go we take the restaurant boat shuttle for the Ristorante Da Teresa, which departs from the Amalfi harbor near the Hotel Bussola. The boat brings you right to a small pier between the rocks where you can easily debark and find a sun bed nearby. Tip: If you want a bed along the water’s edge, head to Santa Croce earlier in the morning! But the view from the second row is pretty darn nice, too. I’ve always been fond of the color orange, and it makes such a striking view against the back drop of the blue sky and sea. This is a view that soothes the soul and relaxes the muscles. Looking west from the beach you can spot the Arco Naturale, a natural arch, that is a popular spot for swimmers and rock climbers who scramble up and dive off the top. Not me, naturally. I’m the one sitting on the sun bed taking photos. 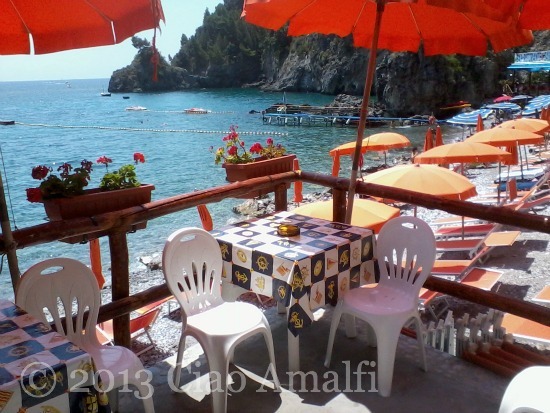 If you don’t want to take one of the restaurant shuttle boats, there’s a boat service that connects Amalfi with Santa Croce and the nearby Duoglio beach. Every once in awhile the peace is interrupted by the boat ladder flopping down onto the pebbly beach and and the crew calling out the next departure times for Amalfi. We enjoy going with the Ristorante Da Teresa boat service because we’re always so tempted by the delicious scents wafting out from the restaurant that we either take a break from the sun to enjoy lunch on their gorgeous terrace or have sandwiches or fried calamari right down on the beach. Oh … and don’t forget the local white wine with slices of fresh peaches. Really, this is something you don’t want to miss! This year in addition to the large, covered dining area there is a new spot (above) with tables and umbrellas that looks like the perfect spot for enjoying a panino or coffee. 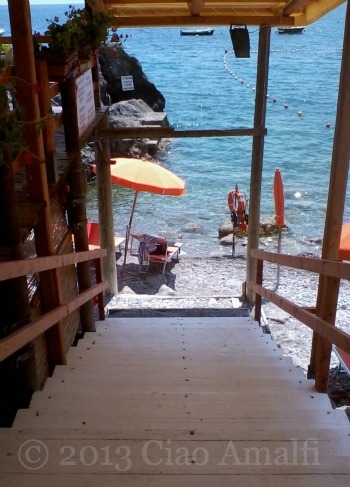 Nearby the stairs leading down to the beach caught my eye … that’s what you call a stairway to paradise! There’s a moment when I just can’t stand it anymore and I grab my camera and go for a stroll to take photos. This is beach where you’ll definitely want to make sure you have flip flops or beach shoes of some kind, because the stones are large and hot after baking in the sun all day. Getting into the water can also be a bit challenging with the stones and rocky beach, but once you do it’s well worth the effort. Sometimes it’s easiest to just get as close to the water as you can, stash your flip flops somewhere nearby where the waves won’t wash them away and just do an oh so elegant … splash! Don’t worry, that’s pretty much what the locals do, too. Before leaving I had to catch just one more image of the rocky beach and an orange umbrella framing a perfect view of a white sailboat. What did I say? Yes, definitely a slice of heaven!